Within a transitional period of five years from the effective date, PICs under the old Civil Code Article 34 are required to apply for conversion to a newly enacted incorporated organization in accordance to the PIC Laws. As of December 1, 2011, there were 19,860 PICs under the old Civil Code Article 34 including 9,115 foundations and 10,745 associations, says the 2012 annual report on PICs under the old Civil Code Article 34. Among them, 2,084 applications were approved for transfer to PICs under the new PIC Laws, while 809 received approval for transfer to General Nonprofit Corporations (GNCs) (source: Bulletin from the Cabinet Office, “Records of applications nationwide as of 30 Nov 2011 under the new PIC system”). Additionally, 116 were approved for change from GNCs (established on and after December 1, 2008) to PICs. From October 2010 onward, corporations who received the official approval can select the date of transfer registration. By choosing April 1 as the date of such registration, corporations can avoid mid-term book closing and minimize accounting burdens involving the transfer. Hence there is a time difference between the number of approvals issued and the number of corporations actually registered. *As of March 31, 2013, 7,692 organizations have obtained approval for the transfer to PICs; 8,485 for the transfer to GNCs; and 228 for the transfer from GNCs to PICs. 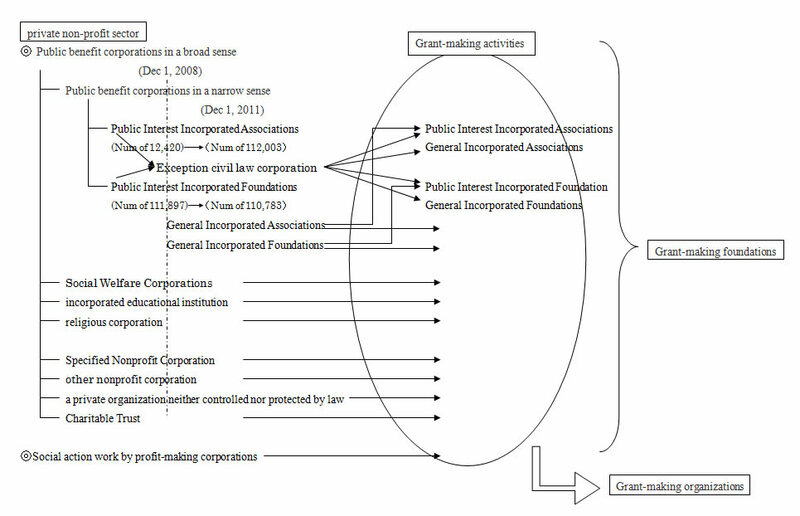 This statistical study defines, as before, the “Grant-Making Foundations” as the organizations that conduct one of the following activities without differences between three types of legal entities including PICs under the old Civil Code Article 34 and new PIC Laws, and GNC under the new PIC Laws. To provide fund for research and/or projects that are carried out by individuals or groups. To award scholarship or fellowship fund to local/international students and researchers. To present commendations including prize money to exceptional work by individuals or groups. Those “grant-making foundations” include Public Interest Incorporated Associations under the old Civil Code Article 34, Social Welfare Corporations, and other PICs as they engage in similar activities, although their legal status is different from that of Public Interest Incorporated Foundations under the old Civil Code Article 34. In contrast, Specified Non-profit Corporations, Independent Administrative Agencies, Charitable Trusts, and other corporations including internal foundations are excluded from the study. government database and other information sources. Group A foundations responded to surveys from 1987 to 2012. They outlined organizational data and the content of their programs and are active in their grant programs. The year of establishment, competent government agencies at the time of establishment, and other data not subject to yearly change were examined on Group A. The number of Group A foundations is 1,590 (as compared to 1,505 in the 2011 survey). In the foundations within Group A who furnished the 2012 July survey with the latest data (i.e. FY2011 statement of accounts), those who stated the net assets and the annual grant total exceeded \5 million were defined as Group B. The size of assets, the scale of operations and other data subject to yearly change were examined on Group B. The number of Group B foundations is 771 (as compared to 754 in the 2011 survey). The number of newly established foundations reached its peak in 1990, followed by a significant decline since 1991. In 771 foundations of Group B, 91% or 703 foundations employed new accounting standards while others continued to apply former accounting practices. There have been two accounting standards since FY2008, when the government introduced the new accounting standards for Public Interest Corporations to include statements about market valuation. Therefore, total assets and the ranking of assets cannot be defined by the same standards. At the end of March 2012 (at the closing of FY2011), Group B included 334 public interest incorporated foundations, 23 general incorporated foundations, 7 public interest incorporated associations, and 1 general incorporated association. While some of the foundations/associations changed their legal status during FY2011, and hence their settlement of accounts was made in mid FY, their grant distribution amount was summed for the entire year. However, some new foundations who supplied monetary amount for only the period after transfer were excluded from the analysis. During FY 2011, 771 foundations provided a total of about \62.0 billion for grant activities. Foundations with yearly grant distribution of less than \50 million accounted for 74%, while 2% exceeded \500 million or more. Comparing the size of grants in the top 20 foundations between Japan and the U.S., the gaps were about 29 times. Research and its supporting field of science programs, culture, health and welfare, civic activities as well as scholarships benefited from foundations and stayed in the ratio of 5:2:3 through 2011. However, in 2012 the ratio of grants changed to 2:1:1, reflecting the needs of time. Examined by field of activities, “science and technology,” “health and medicine” and related fields of natural science come first as the main sector. For the last 10 years, the ratio of grant programs by field remained almost unchanged. Total sum of the grants has been shrinking since 1993 due to the low interest rate policy in the wake of the collapse of bubble economy.